Many webmasters are frustrated by the 999 row limit in the new Google Search Analytics reports. What they may not realize is that you can get 5000 rows of data from the Search Console API per query, and Analytics Edge makes it easy to get that data (and more) into Excel. One user reported over 220,000 rows for their property! 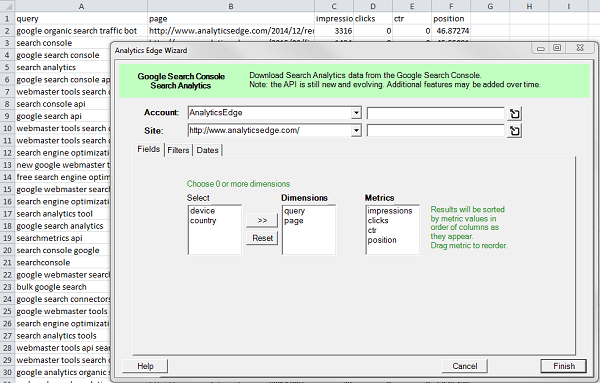 The new Google Search connector from Analytics Edge lets you download over 5000 rows of search data if it exists, with query, page, device and country dimensions and filters. The connector automatically makes multiple queries to get all your data, and an Analytics Edge macro can be used to automate your search engine optimization analysis and reports – view our free reports now. With no account or query limits, the connector is available free for 30 days and can be licensed for only $50 / year.